Plays don’t often get more ambitious than Dionysus in Stony Mountain, the final show of Theatre Projects Manitoba’s current season. 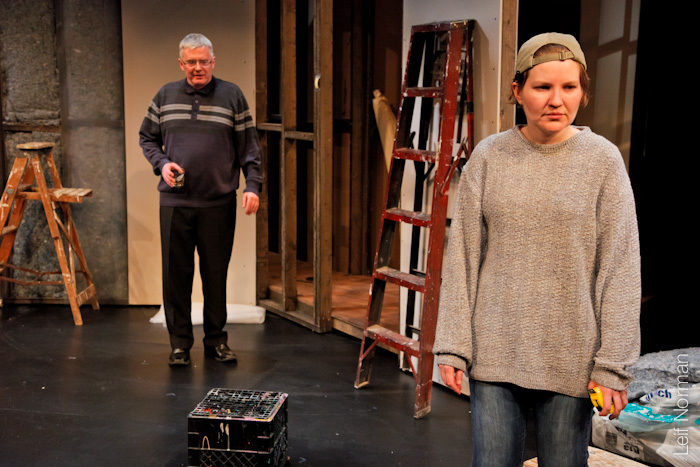 With two actors, a modest set and just two hours of stage time, the play sets out to tackle Canada’s penal system, modern liberal values, environmentalism, mental health, intergenerational strife, capitalism, Christianity and Nietzsche. Make no mistake: this writing is thick with thought, particularly the first act when up-for-parole James (Ross McMillan) explains to prison psychiatrist Heidi Prober (Sarah Constible) why he’s traded his lithium for Nietzsche (McMillan returns in the second act as Uncle Eric, dispatched by Heidi’s distant parents to investigate why their daughter has quit her job and dropped off the map). It’s not always possible to keep up with the play’s philosophical arguments; not with a writer as subtle and well-read as Steve Ratzlaff. The words come fast and furious (often furious), not just leaping from subject to subject, but pirouetting through the air. But that’s fine; you don’t need catch everything. It’s not necessary to get every Nietzschian skewering of Winnipeg, penitentiaries and small-L liberalism (though a quick glance at Nietzsche's Wikipedia page before you attend won't hurt). The only point you need to grab onto is that Nietzsche proposes a world free of moral baggage. If the weak get crushed by the strong, hey, that’s only natural. How desperately, gut-wrenchingly attractive that mindset is for anyone trying to escape guilt – guilt at being unable to repair a broken world. And that, ultimately, is what Dionysus in Stony Mountain is about: how we use institutions, philosophies and religions to cope with the ‘dark nights’ of human existence. And how, when those systems fail, what we’re left with is each other. It’s a moving, compassionate play about pain that succeeds if you can hang in when something goes over your head (it did many times for me during the night). Constible and McMillan handle the denser material with speed and style, but it’s in the moments of open, honest vulnerability that the actors really shine. While there are times in the evening when Bill Kerr’s direction strays from the relationship between these two actors - McMillan’s speeches directly addressed to the audience stand out - wait a moment and the play gets back on track. Is deep, philosophical writing an act of intellectual snobbery? No. It’s an invitation to think about meaningful, resonant issues, both specific to Manitoba and universal to human life. Now that’s an ambitious play. Dionysus in Stony Mountain (by Steve Ratzlaff) runs until Sunday, April 8 at Theatre Projects Manitoba. "thick with thought:" Nice phrase.